This fortnight's theme is Ocean! A super casual two week jam run one after the other. Drop in whenever, release your game whenever, just make something for fun! It is by smithing that one becomes a smith, and it is by game-making that one becomes a game. 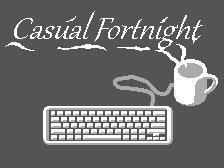 Casual Fortnight is about learning by doing, and it's about practicing and honing skills you may or may not already have. It doesn't matter what you have by the end, it matters that you learned something making it! The only rule is that your game must in some way be the product of this fortnight. You may use code, music, assets, equipment, and moral support figures from before the jam, but the thing you put together with those pieces must be made during the jam.